WINNER OF THE ANTHONY AWARD® for Best Paperback Original! WINNER OF THE MACAVITY SUE FEDER MEMORIAL AWARD for Best Historical Fiction! A 2017 EDGAR AWARD® NOMINEE! In the waning days of a lazy August holiday, Ellie Stone is enjoying a bright Adirondack-lake morning. Nearby, two men plummet to their deaths just a few feet short of the water of a dangerous diving pool. A tragic accident, it seems. But the police quickly establish that the two victims—one a stranger to the lake and the other a teenaged boy from a nearby music camp—surely didn’t know each other. So how did they come to die together? Wading into a slippery morass of free-love intellectuals and charismatic evangelicals, Ellie’s investigation forces her to navigate old grudges and cold war passions, lost ideals and betrayed loves. As usual, she sticks her nose where it’s unwanted, rattling nerves and putting herself in jeopardy. But this time it’s her heart that’s also at risk. "Ziskin's...smart and aggressive protagonist has real personality.. .. superb. Don't miss this series." "Ziskin is masterful with his 1960s nostalgic descriptions and his portrayal of the difficulties for women in the workplace during that era. His smart and sassy protagonist, Ellie Stone, is far from perfect. Ellie is, however, liberated, impulsive, and has a personality with heart. The plot is solid with plenty of twist and turns and a powerful ending that will leave readers wanting more." 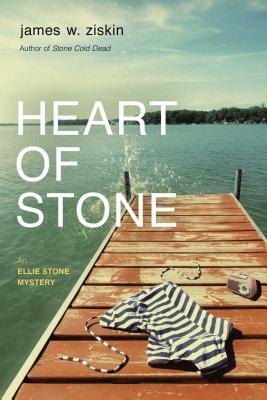 "Ellie is a refreshing, riotously funny amateur sleuth. Spot-on language and perceptions of the era are a plus."